Lovelane’s 30th Anniversary Hoedown Legendary Chef Line-up! Volunteers are essential at Lovelane. Lovelane volunteers proudly and generously give their time and their heart to support and provide for our students and horses. Our volunteers groom, tack, and lead horses; they encourage our riders; they ensure that our students have productive, fun and safe experiences at Lovelane. Volunteering at our therapeutic riding center gives you an opportunity to be outdoors, to provide joy and challenges to people with disabilities, to meet other volunteers and to work as a team. Our riders, in turn, provide many rewards for you – smiles, camaraderie, enthusiasm, and pride in the progress of their skill. Please consider joining us, we could not run our program without the hundreds of volunteers that give their time to us! There are many ways to help. Make a donation today. Find out more about how to volunteer. Or check out our wishlist. 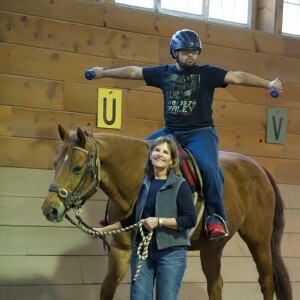 In a fun, supportive environment, Lovelane provides high-quality therapeutic horseback riding to achieve occupational, physical, speech, cognitive and other therapeutic gains, focusing on children with special needs.